The Catholic Committee on Scouting recently held its annual Religious Awards Ceremony at Our Lady of Mercy Church in Baton Rouge. Father Randy Cuevas celebrated the Mass and was assisted by Deacon Richard Grant, who is the scout chaplain. 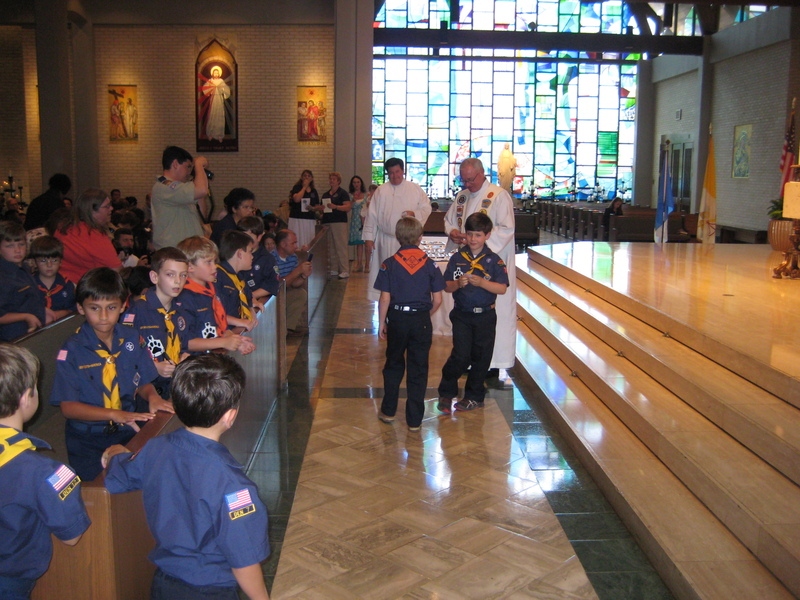 Golden Medallion Award – The Golden Medallion Award program, presented to CCOS of the Diocese of Baton Rouge, is established to identify and recognize the outstanding Catholic Cub Scout Pack, Boy Scout Troop, and Venturing Crew/Ship in each of the 15 Episcopal regions of the United States. It is also intended to promote the National Catholic Committee on Scouting’s initiative to increase scouting units, youth members and adult leaders. National Gold Medallion winners epitomize those units that excel at providing youth with quality programs including religious activities, religious emblems participation, outdoor activities and special events that encompass the religious, vocational and educational aspects of scouting under Catholic auspices. National Unit Recognition Award – Ship 7 was the recipient of the Pope Paul VI National Unit Recognition Award. This award recognizes the Chartered Partner, the individual unit and its adult leadership to provide each boy with a quality program encompassing religious and educational aspects of scouting. Ship 7’s project was participating in cleaning the grounds of the Catholic Deaf Center. Bishop Stanley J. Ott Service Recognition – St. George Catholic Church Girl Scout Brownie Troop 10188 was the winner of the Bishop Stanley J. Ott Service recognition award. The Light in the Lord Service Recognition was named to honor Bishop Stanley J. Ott STD, Bishop of Baton Rouge until his death in 1992. This diocesan recognition was offered for the first time in 1994. It is awarded to scouting groups that demonstrate service to the community in keeping with the ideals as lived and preached by Bishop Ott. Boy Scout and Girl Scout groups of all religions and ages are eligible for this recognition. The troop built a butterfly garden at St. Vincent De Paul Sweet Dreams Women and Children’s Shelter. International Catholic Awareness Activities – The International Catholic Awareness Activities unites the Catholic Church and the scouting movement all over the world. It contributes to the complete education of young people through scouting from the perspective of the Catholic faith. It develops and enhances the spiritual dimension of scouting. The Catholic Religious Emblem programs administered by the National Catholic Committee for Girl Scouts and Camp Fire (NCCGSCF), under the auspices of the National Federation for Catholic Youth Ministry (NFCYM), allow young people to explore and become more involved in their Catholic faith. All programs are designed to support and complement the catechetical efforts of Catholic church parishes and schools. Family of God – Family of God is the official religious recognition program of the Roman Catholic Church for children ages 7-9, (2nd and 3rd grade), who are enrolled in Girl Scouts and Camp Fire. Family of God is a bilingual activity series developed to complement the catechetical efforts of the parish and families with children in the second and third grades. Revised and transliterated into Spanish in July 2004, the program helps children discover the presence of God in their daily lives as members of their family and parish. The Family of God is an excellent supplement for children preparing for the reception of their first Eucharist. I Live My Faith – The I Live My Faith program is designed to help Girl Scouts and Camp Fire members, ages 9-11 (5th to 7th grades), appreciate more deeply the place that God and religion occupy in their daily life. The action-oriented activities focus on developing awareness within the individual of his/her potential as a growing person, friend, family member, citizen and a participant in the community of faith. The program is divided into three chapters, “Stretching,” “Seeking” and “Finding,” each of which blends the dimensions of discovery, prayer, service and sacrament into a unified whole. Mary, the First Disciple – The Marian Medal program is written for young Catholics, ages 12-15, to enable them to “proclaim the greatness of the Lord.” This is accomplished by actively involving the participants in an understanding of Mary as a model of openness and spirituality – a woman of the church. Through various projects, discussions and liturgical celebrations over a period of months, the participants are provided with a unique opportunity to develop new insights into their personalities, friends, parents and the world around them. Spirit Alive – This program is designed for Catholic youth in high school who are in the senior level (9th to 12th grades) of Girl Scouts or Horizon Club members of Camp Fire Boys and Girls. The Spirit Alive program assists the scouts in discovering how the Holy Spirit moves in their lives, calling them to greater participation in the church’s ministry. Light of Christ – In the Light of Christ program, Tiger Cubs and Wolf Cubs Scouts (first and second grades) learn to develop a personal relationship with Jesus where they see him as a real person and a friend. This program fosters early family religious involvement. Parvuli Dei – The Parvuli Dei (Children of God) emblem is to help young boys (Bear and Webelos Scouts, third to fifth grades) explore activities to discover the presence of God in their lives as members of their families and parishes. The program aids the scout in his awareness of the responsibilities that grow out of God’s love for us. 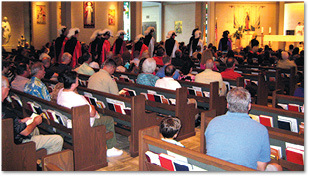 Our Lady’s Award – This award is unique to the Diocese of Baton Rouge and is earned by Girl Scouts, Cub Scouts, Boys Scouts, and Camp Fire in grades four through six. This program teaches the scouts the importance of Mary as a model for our life because her life leads us to Jesus, especially through learning the rosary. Pope Pius XII – Pope Pius XII was a supporter of youth and scouting. The National Catholic Committee on Scouting created this emblem in his honor. The Pope Pius XII Religious Award is Catholic Scouting’s church-related ministries and vocation program for Boy Scouts, Varsity and Venturing Scouts, 9th grade through college age. The program deals with different life choices (single, married, religious, ordained), occupations and ministries in the church as calls from God. The scouts evaluate their own personal talents and abilities where they realize Christian life enables the Scouts to share their faith and affects daily life in the greater world. It includes youth-led discussions on current issues facing the church and society. The scouts become conscious of the importance of scouting and the relationship to active ministry in the Catholic Christian faith community. 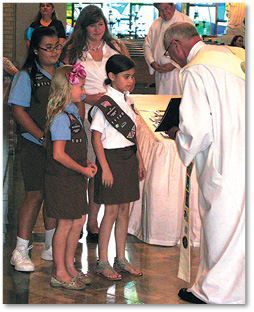 Father Randy Cuevas presented the awards, including those to the Girl Scouts. Cub Scouts walked up to receive their awards.